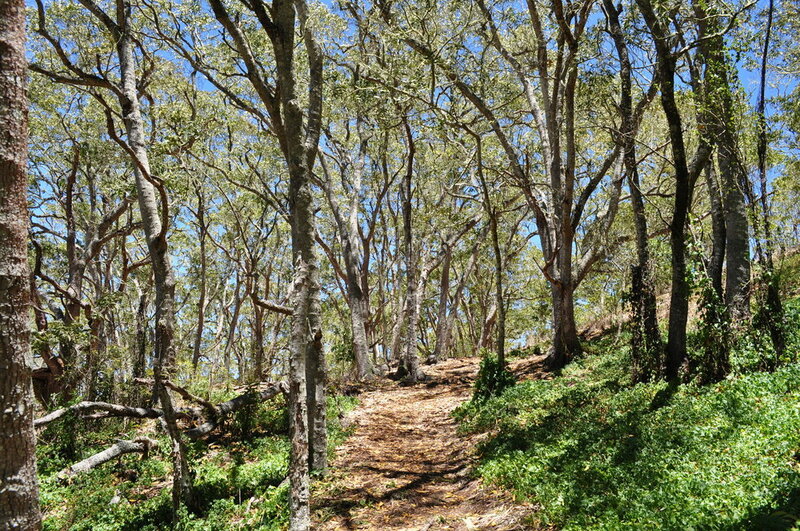 Pu’u Huluhulu is a kipuka (small pocket) of native trees and native birds. 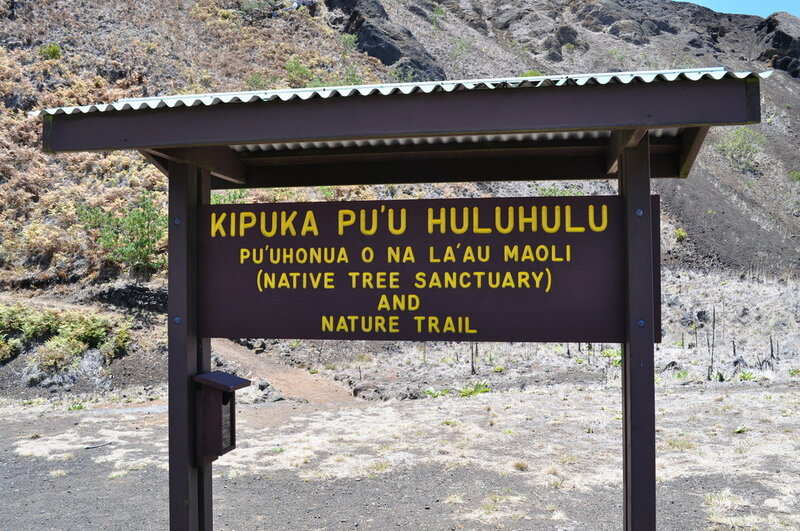 The area is located along the Daniel Inoye Highway (Saddle Road) near the turnoff for the Mauna Kea Visitor Center. Approximately an hour from The Palms Cliff House Inn. This kipuka is without a doubt one of this island’s best kept secrets, and it is right out in plain view. 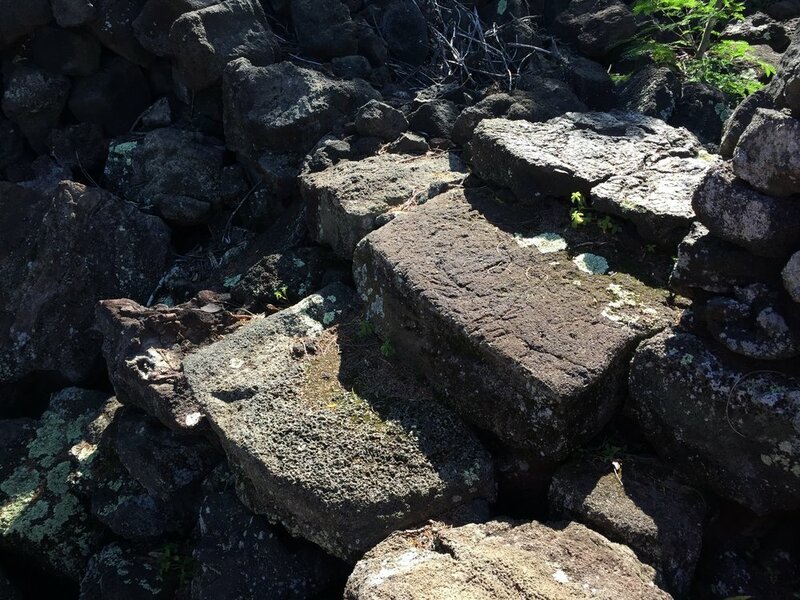 Pu’u Huluhulu means shaggy hill, which, when you see it, is exactly what it looks like. It is fenced in to keep the destructive pig population out. but there is not entry fee and is worth a 20-40 min stop in your busy sightseeing day. I like to take a lunch or snack with me so that when we summit the hill we can sit and enjoy the view and the sweet bird songs that surround us. 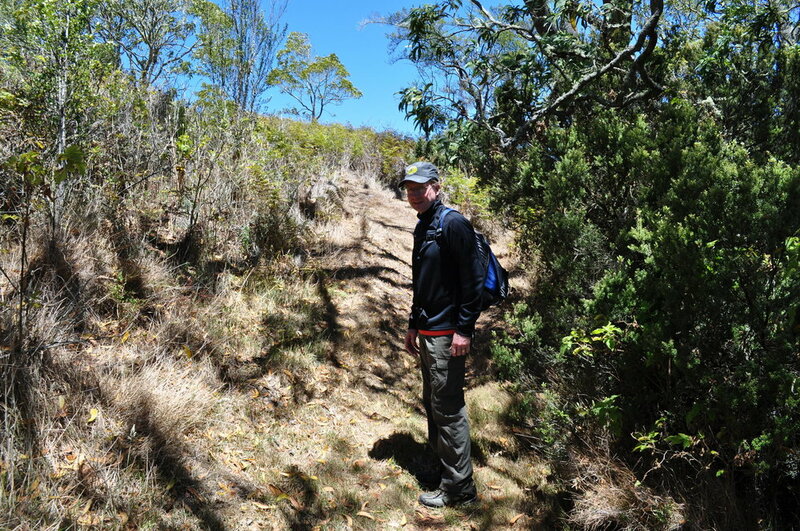 The hike is not difficult and the trail is well maintained. but there is an incline, so just remember that you are hiking at roughly 6,000 feet and take it slow. Stop to catch your breath. you are technically at high altitude. as you can see from our photos it is a really lovely place, of course being there in person is always better than photos. just remember to pack out anything you pack in. once in the kipuka there are no services. 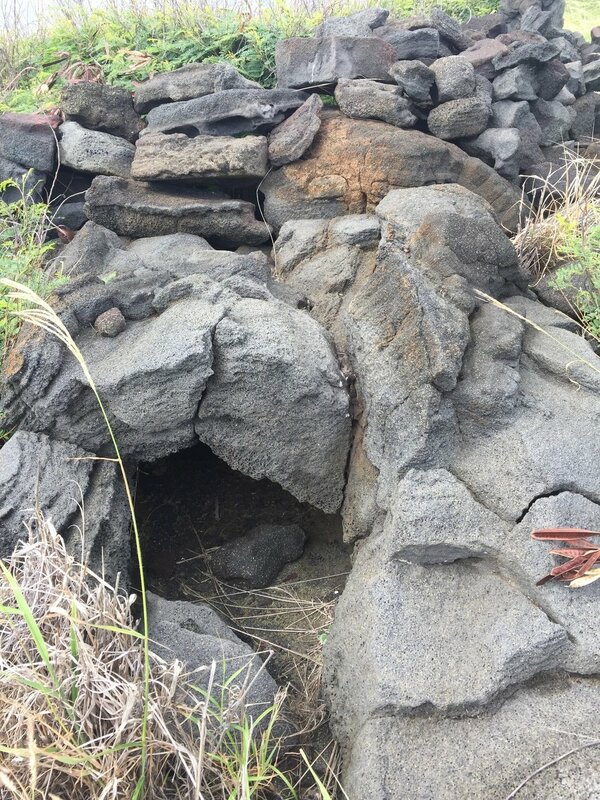 Enjoy your visit to Kipuka Pu’u Huluhulu! John and I have made a point of 'getting to know' our Island during the 20 years we have lived here. It is a wonderful place to explore and was a joyful playground for our two sons when they were young. One of the places that has continued to draw us back time and again is the coastal shoreline from Kaalualu Bay to Kii. For those not familiar with the Big Island, I am speaking of the district of Kau, along the coast, near what is commonly known as South Point. We travel there several times a year, to camp, to fish, to hike, and to explore. Our last visit to the area was this past week. Now, I must quantify that four wheeling in this area is not a riotous romp across the countryside. 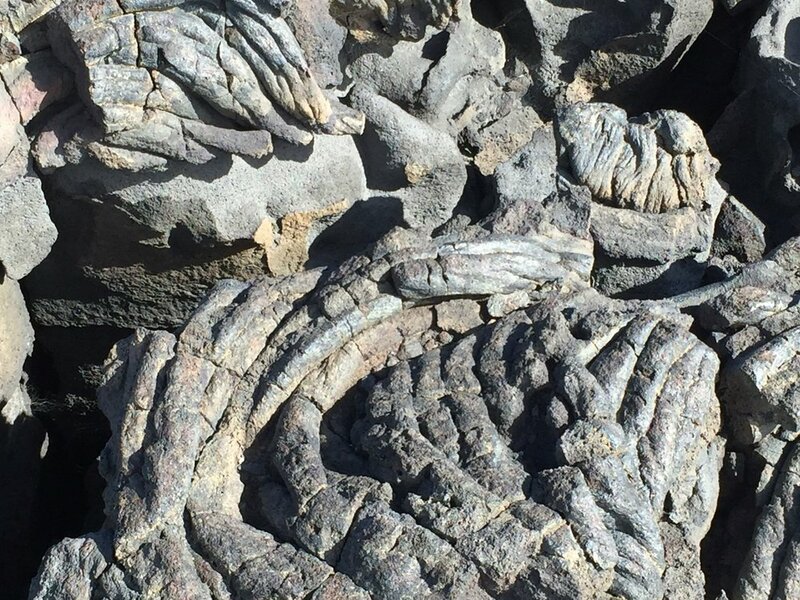 It is a slow and cautious journey across a'a' and pahoehoe lava fields. Usually we get distracted by something we see and hop from the Pathfinder to go explore on foot. But as I said, it was unusually windy on this particular day. As a result, we explored in our Pathfinder much farther than we had ever gone before. Armed with both modern and really old maps of the area we pinpointed several locations by name, something we had been hoping to do for years. But the peak of our adventures was to reach the end of the tidal areas and come face to face with the southern end of the Kau Cliff line. 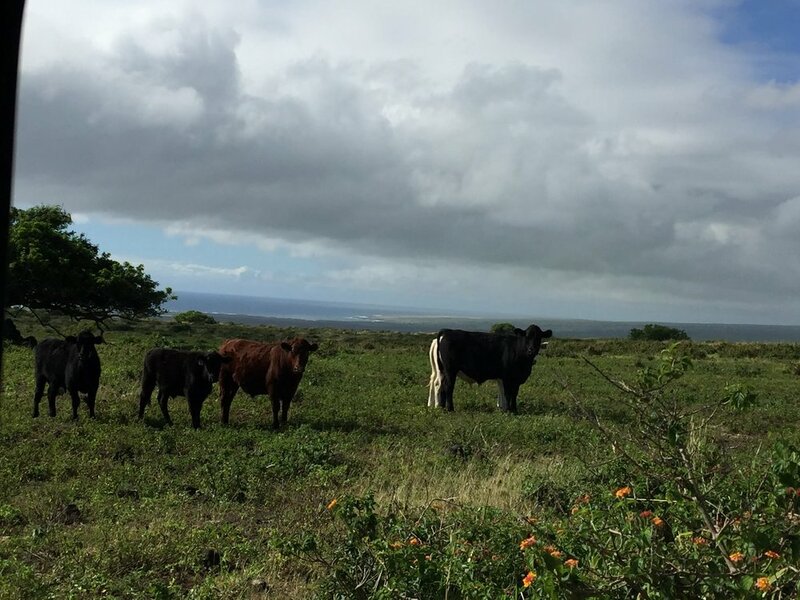 What makes this area so special is that long ago it was home to a small fishing village, known as Waikapuna. This area is actually privately owned, but we know the owners and land managers and ALWAYS ask before we go for permission. Asking first is not only the right thing to do, it is the local thing to do. We had a wonderful time exploring the remains of old walls and buildings and of course the beautiful bay and ocean. Waikapuna is testament to the changing nature of the Big Island. Waikapuna had been a thriving fishing village with fresh water springs located on old lava tubes. A series of earthquakes in the area changed the water table and ended the fresh water supply. Thus ended the once thriving fishing village. This all happened in the late 1800’s. It is still a beautiful spot, though it’s remote And difficult location makes it a place few can enjoy. Hopefully you may enjoy it vicariously though our photos. The winds swept the coast with more force than we were accustomed to (and the area is know for it's wind), as a result we did less hiking and more four wheel driving (NOT for the faint of heart or rental car) over sharp lava fields. Trust me, the last thing you want to happen in a remote area is to be blown over onto sharp lava. The seldom told stories of Hawai‘i’s Hansen’s Disease sufferers who were exiled to Molokai will come alive in their own words when ‘Imiloa Astronomy Center hosts Dr. Kerri Inglis, Chair, Department of History at UH Hilo, for her talk “Ma‘i Ho‘oka‘awale ‘Ohana & the Journey into Exile: Hansen’s Disease in Hawai‘i, 1866-1969” on Thursday, May 1, at 4:00 p.m. The talk is presented as part of a continuing series being offered in conjunction with the Smithsonian traveling exhibition, “I Want the Wide American Earth: An Asian Pacific American Story.” Attendees may also tour the exhibit, which is on display until June 1, 2014 as part of a 13-city national tour. From 1866 to 1969, approximately 8,000 persons were quarantined or exiled to the leprosy settlement at Kalaupapa. Endeavoring to recover the voices of the patients who lived through this significant moment in Hawaiian history, Inglis will present her research on the letters and articles that patients and their loved ones wrote to the Board of Health and Hawaiian language newspapers in the 19th century, and share oral histories that were collected in the 20th century. 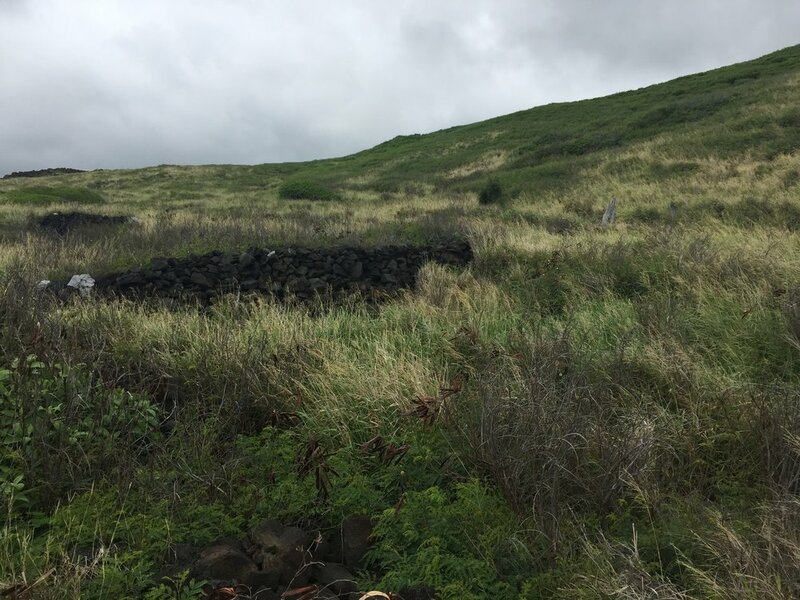 Together these records tell the story of a disease, a changing society’s reaction to that disease, and the long lasting consequences of that experience for Hawai‘i and its people. Kerri A. Inglis serves as Chair of the Department of History and Associate Professor of Hawaiian & Pacific Islands History at UH-Hilo and is the author of Ma‘i Lepera: Disease and Displacement in Nineteenth-Century Hawai‘i (Honolulu: University of Hawai‘i Press, 2013). 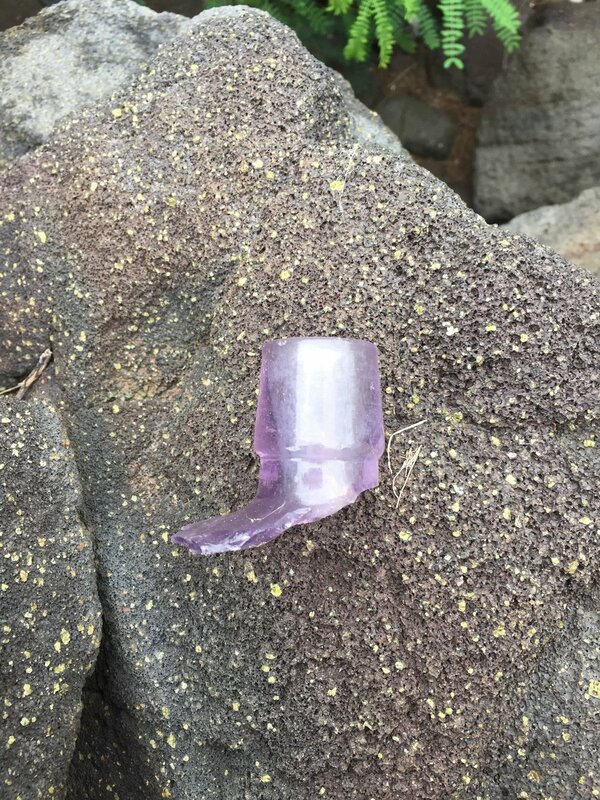 Her professional interests include research and teaching on the history of disease and medicine, especially as they pertain to Hawai‘i and the Pacific, within a global context. 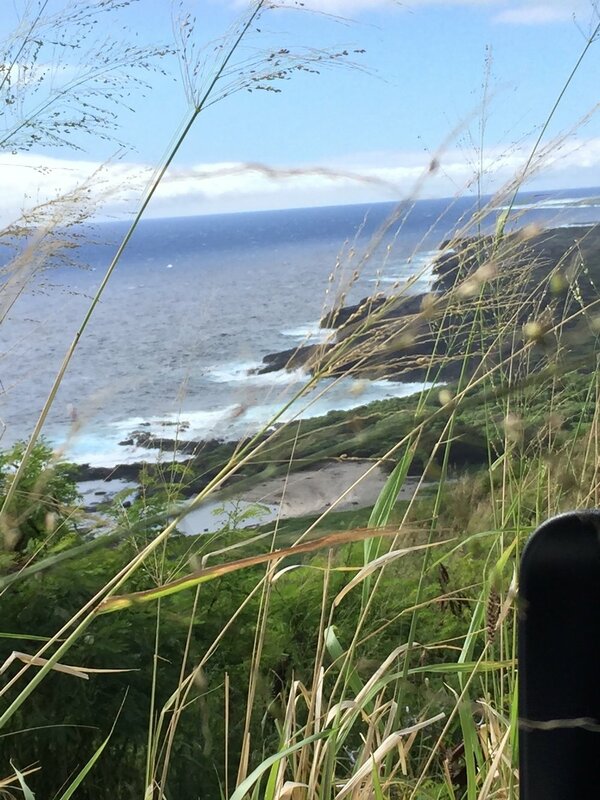 Inglis visits Kalaupapa regularly, and takes a group of UH Hilo students to the peninsula for a service-learning opportunity (for one week) every fall semester. The Smithsonian traveling exhibition, “I Want the Wide American Earth: An Asian Pacific American Story,” celebrates Asian Pacific American history across a multitude of diverse cultures and explores how Asian Pacific Americans have shaped–and been shaped by–the course of the nation’s history. Cost is $8 for members, $10 for general admission. Pre-purchase tickets at the ‘Imiloa front desk or by phone at 969-9703. ‘Imiloa Astronomy Center of Hawai‘i is a world-class informal science education center located on the University of Hawai‘i at Hilo campus. ‘Imiloa is a place of life-long learning where the power of Hawai‘i’s cultural traditions, its legacy of exploration and the wonders of astronomy come together to provide inspiration and hope for generations. The Center’s interactive exhibits, 3D full dome planetarium, native landscape, and programs and events engage children, families, visitors and the local community in the wonders of science and technology found in Hawai‘i. It is open to the public from 9 a.m. to 5 p.m. Tuesday through Sunday (closed Mondays). For more information, visit the website at www.imiloahawaii.org. Girl’s Day is Saturday, March 3, 2012. On Display Will Be A Collection Of Japanese Kokeshi Dolls & Antique Traditional Girl's Day Hina Matsuri Display, With Accompanying Accessories, Dougu, Consisting Of More Than 100 Pieces. Girl’s Day, which takes place on the 3rd of March each year, is celebrated with special food and with elaborate displays of dolls representing the Emperor and Empress and in the most elaborate displays, their full court of attendants and household goods on a graduated dais covered in red. This event originally began in the Edo era; traditionally, this event was only celebrated by the young daughters of the Imperial Family and the Japanese upper class, but gradually this festival became integrated into the celebrations of the common people. In a time when marriage was a woman’s only option, such displays were thought to encourage the daughter to aspire to a prosperous match and to ward off evil and promote the health of the young girl. On Boys’ Day, celebrated in early May, helmets, armor and warrior dolls were displayed to encourage young boys to see the glories of military service as a man’s duty. In carrying on with the tradition, Hina dolls are lovingly viewed and special sweets that can only be eaten on this day are consumed. This is the day families still pray for the happiness and prosperity of their girls and to help ensure that they grow up healthy and beautiful. The celebration takes place both inside the home and at the seashore. Both parts are meant to ward off evil spirits from girls. A girl's first "Girls' Day" is called her hatzu-zekku. On a girl's hatzu-zekku it is very popular for the girl's grandparents to buy her a display. This display can have up to seven tiers with dolls, A Palace, and small furniture. At the top is always the dolls of the emperor and empress with a miniature gilded screen placed behind them, very much like how it is in the imperial court. Most families take out this display of dolls around mid-February and put it away immediately after Hina Matsuri is over. There is a superstition that says that families slow to put away the dolls will have trouble marrying off their daughters! This is one of the best Meiji-era images of the Japanese Doll Festival decorations I have seen during. I love the detail of the display as photographed by Meiji-era photographer T. ENAMI. I have been collecting my Hina Dolls for 15 years. Gathering a piece here and a piece there. Discovering treasures both here in Hawaii as well as purchasing items in Japan. The most fun for me at the household items. The attention to detail is incredible. As my display grows, so does the space required to house it when not on display. Three shelves in my office as well as a full closet are devoted to my ever growing collection. I hope you have enjoyed looking at my collection of Hina dolls, if you are in the area on Girl’s Day, please stop by to see it in person. I’d be more than happy to show and share it to you!